How to determine speaker acoustic center? First of all, determining the speaker acoustic center is useful when designing loudspeaker crossovers. The point from where the speaker is radiating sound is somewhere near the voice coil area. As a result, big speakers, like woofers, have the acoustic center somewhat in the back. On the other hand, tweeters, which are more shallow, are in front, acoustically, compared to woofers. This offset, whether expressed in units of time or distance, must be taken into account to have an accurate representation of the phase between the drivers of the loudspeaker. The loudspeaker is placed on a small box to raise it up slightly. This is to place the speaker in the center of the room and reduce early room reflections. The microphone is placed at 1.2 m from the floor, on the same axis with the middle of the midrange driver. Microphone is 1 meter away from the speaker. What we need to do is to take a far-field measurement of each individual driver. After that, take another far-field measurement of all the drivers wired in parallel. I’m making the measurement using sweeps from 200 Hz till 20 kHz. Not going down till 20 Hz for 2 reasons. First, my room only accommodates accurate measurement only till 200 Hz. Second, starting from 200 Hz protects the tweeter. Already there is something weird about the combined response (red line). I’m talking about that dip. No worries. It should look weird. That’s because of the acoustic offset of the speakers. We’ll calculate each speaker acoustic center distance soon enough. I like to set the Ref time just before the initial peak (time 0). So, I go for -0.2 ms. Then, set the right window according to your room size. Or check the impulse response to see when is the 2nd big peak (which corresponds to the first room reflection). In conclusion, I set the right window to 4.7 ms. The left window is irrelevant, but I like to set it low, like 15 ms. This is true for both mid and tweeter. For the bass driver and for the combined response it’s not the same, at least in my case. It would be for a 2 way bookshelf on a stand, for example. But here, the 2nd bass speaker and the port are too close to the floor and room reflection hit the microphone earlier. Here, the window is only 3.4 ms. Check your exact impulse response for an accurate time window. If you are having trouble with this, let me know in the comments and I’ll see if I can clear things up. We will load just the frequency response file for each driver. The impedance is not of interest. So, right click the first driver and click Tune. Load the appropriate file. After the file has been loaded, we need to click the “derived” check box. This will fix any errors with the measurements and extend the frequency response measurement by following its trend. Just to make an analogy : Imagine you are measuring a large piece of land using rudimentary measuring tools. And this land is a right angled triangle. After you measured each side you can apply the Pythagorean theorem and make corrections so the theory holds true. That way you know you are closer to the real values. This is what the Hilbert Bode Transform kinda does. This is how the HBT looks like. We need to set the tails for the ends of the response curve. We know that the response is not accurate below 200 Hz, because of the width of our window when we made the measurement. In conclusion, we set the lower tail just above 200 Hz. Try to follow the natural roll-off of the tweeter so the blue line matches the red line. In our case, 10.5 dB / Octave slope. As for the other end, 20 kHz, we know that the tweeter will lose amplitude quite quickly, as it’s not an expensive tweeter. In conclusion, 18 dB / oct seems appropriate. Do the same for the midrange. Same procedure for the bass driver. Next step is to load the combined response file so it shows on our graph. Click “Curves -> Get File” and load the response with all the speakers combined. Blue line – Is the modeled response from our circuit. Green line – Is the measured response of all the speakers wired in parallel. 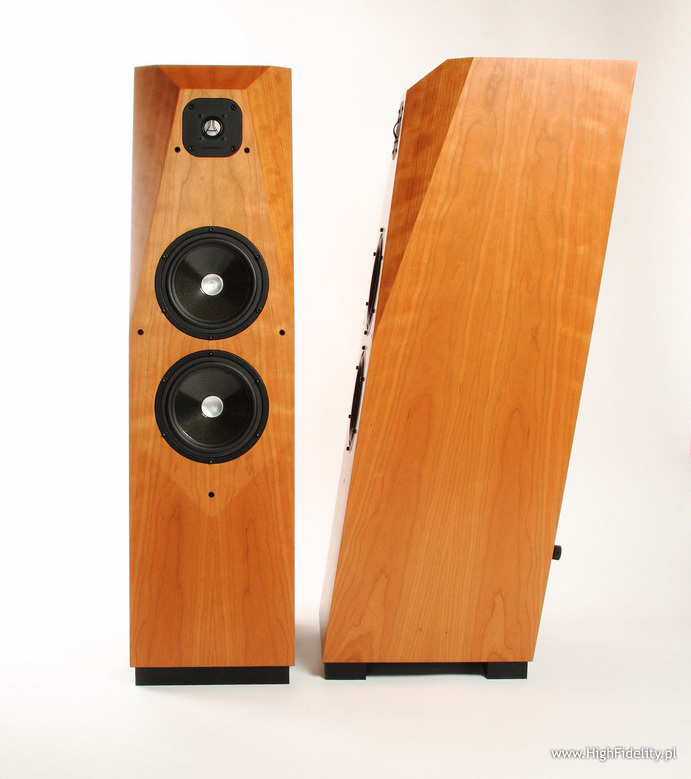 The goal here is to match the two curves by altering the delay of each individual speaker. This will determine the acoustic offset between the drivers. Let’s start with the bass driver. Since it’s a woofer, the sound will arrive the latest. Right click the speaker and click Tune. Now fiddle with the delay until you get the curves to overlap. At 1.6″ the 2 curves overlap nicely. Still there is a problem for the upper frequencies. Now let’s switch to the midrange driver. After a bit of fiddling, the curves started to overlap for a negative delay number. This means that the midrange is in front compared to the tweeter. Usually this does not happen. However, since the microphone is placed on axis with the midrange driver, the sound coming from the mid arrives first, in our case. You want to leave the delay of the frontmost speaker set to 0 (zero). As a result, leave the midrange driver delay to 0 and move on to the next driver. As a side note : If you were to measure a 2-way speaker, place the microphone on-axis with the tweeter. As you can see, this time, the speaker acoustic center is 0.34″ further back. As a side note, this is not the absolute speaker acoustic center. It’s the relative acoustic center of the tweeter compared to the midrange, and relative to the position of the microphone. Now we have found the acoustic offset of each individual driver relative to the microphone. This is particularly useful when you are designing crossovers. It’s a mandatory step, to have an accurate phase representation. Next time you are designing a crossover using XSim, make sure you do this step first before you start designing your circuit. Any suggestions how to measure an absolute speaker acoustic center? I have an ECM8000 microphone, but as I don’t know where the diaphragm is at, it makes measuring an absolute distance difficult. If I’m using ARTA to measure FR response and do not choose minphase but instead just use the measured phase do I still need to find the AC? Can I use measured phase in xsim directly without any manipulation of the .fed file? Does make sense what you are asking, and my first instinct is to say yes. You should verify your results though, as I haven’t done it that way and can’t confirm. I’ve now confirmed it. Using measured phase in xsim works very well. From now on I will only be using measured phase and xsim to design. Using minimum phase and splicing near field does not work so well…this tilts phase and harms the xover design. I have to agree that adding the nearfield response skews up the phase a bit. Now I still measure the nearfield to have an idea on how the low-end looks like. Use only the far-field in XSim, and apply Hilbert-Bode transform more accurately (since I know how to low-end response looks like, and set the tails better). The low-end response is mostly given by the enclosure and not by the crossover anyway (except for specific applications), so the crossover design doesn’t change much (if anything) in that area.